Chart of the Day has recently become one of my favorite blogs to follow. I like the content/writing, typically the visual displays are good and there are lots of posts about sports. There have been more posts about baseball recently as spring training has already begun. A bar chart would be more effective as it would rotate the labels so that they are easier to read. What about consideration for the year? 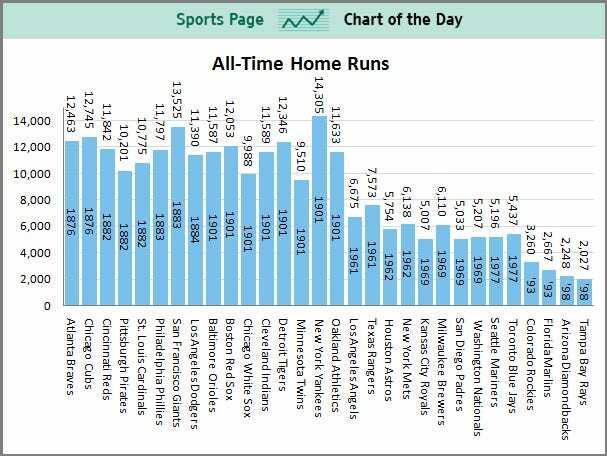 Seems to me that comparing the total number of home runs of teams that have been around for a over 100 years to teams that have been around for just a few dozen years does not seem useful. Is there data that tracks the number of home runs by team per year? If so maybe the data could be normalized, or viewed differently. Excellent point Joe. Colorado is #1 in HR/Game, HR/Win and HR/Year. Arizona is in the top 3 in all 3 categories. I'm going to post another viz now.